JSW - Vijayanagar Works - Overview to improve your experience. Welcome to the world’s sixth largest steel plant. Located at Toranagallu village in the Ballari-Hospete iron ore belt, our 10,000-acre, fully integrated Vijayanagar steelworks is well-connected to both Goa and Chennai ports. With our cutting-edge of technology and constant innovation, it has emerged as a steel plant with one of the most efficient conversion costs globally. Our Vijayanagar facility houses the largest blast furnace in India, producing steel for the ever-expanding needs of all the industries in which it plays a major role. Rolled out in 1997, VIjayanagar Works’ hot strip mill is today the widest in India. It can roll products of a width of up to 2100 mm. By being the first plant in India to use Corex technology for steel and hot metal production, our Vijayanagar Works gained an early-mover advantage and a definitive edge over the competition. At Vijayanagar, preserving and protecting the Earth's precious natural resources is our priority. 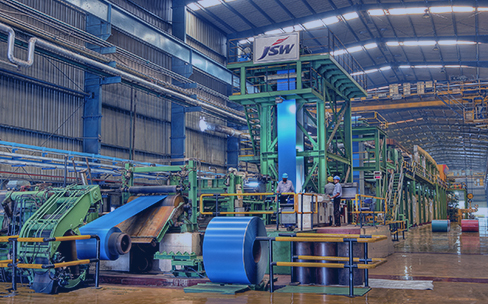 JSW Steel manufactures Hot Rolled (HR) coils, plates and sheets of the highest quality at its state-of-the-art hot strip mills (HSM) in Vijayanagar, Karnataka and Dolvi, Maharashtra.